Stockton, CA – April 9, 2019…One of the biggest events of the season in Northern California is locked and loaded for this Friday and Saturday when the Sprint Car Challenge Tour presented by Elk Grove Ford and Abreu Vineyards converges at the Stockton Dirt Track for the second annual Asparagus Cup. 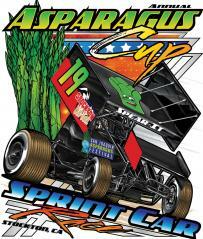 The two-night Sprint Car Challenge Tour event on April 12th and 13th is held in conjunction with the annual San Joaquin Asparagus Festival, which sees more than 65,000 people come through the gates over its three-day run. The inaugural Asparagus Cup race last season saw Australian super-star James McFadden pick up the victory while driving for car owner Willie Kahne. The Sprint Car Challenge Tour presented by Elk Grove Ford and Abreu Vineyards recently opened the season at Placerville Speedway, where Auburn’s Andy Forsberg claimed the big win over Roseville’s Sean Becker and Hanford’s Mitchell Faccinto. Forsberg is a three-time Stockton Dirt Track winner in his career and brought home a podium finish on February 23rd, during an event captured by Hollister’s Tony Gualda. Opening night of the Asparagus Cup on Friday will award $10,000 to the winner and the Saturday finale will pay out a strong $15,000-to-win. Each night will also be a minimum of $800-to-start the A-main. All cars that competed at the Sprint Car Challenge Tour opener in Placerville are also eligible for the $500 Kyle Larson Racing Bonus if they win a feature at the Asparagus Cup. Winged 360 Sprint Cars are the only class running this weekend at the event. Race transporters are going to enter the fairgrounds off B Street through Gate 7 (which runs along the back stretch of the one-mile track). You will then wrap back around on the one-mile horse track towards the pit area. The pit registration booth will be located on the old horse track. The Sprint Car Challenge Tour is proudly sponsored by Elk Grove Ford, Abreu Vineyards, Hoosier Racing Tires, Kyle Larson Racing, All Star Performance, A.R.T. Speed Equipment, BR Motorsports, King Racing Products, Pit Stop USA, Auto Meter, ADCO Driveline and Custom Exhaust, Bullard Construction, Bullet Impressions Inc., Chris Kenner Racing Specialties, CLT Logging, CRV Carbon Solutions, D&D Roofing, Garth Moore Insurance and Financial Services, High Sierra Industries, Keizer Wheels, Kevin Sharrah Designs, Moto Wear, Metal Works, PT Shocks, Quick Time Mortgage and Solar, SprintCarUnlimited.com, Ti 22 Performance and Walker Performance Filtration.